Take a look at what has been accomplished with your support. Pope Francis said, "To change the world, we must be good to those who cannot repay us." Watch how your generosity has helped those in need. Bill’s life trajectory from Harvard School (now known as Harvard-Westlake) to Occidental College to banking to heading up the The Ahmanson Foundation seems a natural path for a scion of one of Los Angeles’ most philanthropic families. But if you follow his path, it is actually one that may have some surprises. During breaks and vacations from Harvard School he worked at a Hungarian independent auto shop cleaning bathrooms, car parts and learning basic auto repair. At Occidental, Bill’s major areas of study were theater arts, concentrating in set and lighting design, Political Science and a minor sculpture. While in college, he applied to Home Savings of America, the bank founded by his uncle Howard, without letting a single Ahmanson know. He got the job, a part-time teller. After 17 years, mostly specializing in turning around troubled offices, Bill’s last position at Home was Chief Underwriter for Residential Lending, responsible for all high-risk loans funded in California. After that, he worked in Union Bank’s wealth management division. All of this experience he applies today. In addition to the Foundation supporting the arts, medicine, programs related to homelessness and low-income populations, Bill is passionate about a relatively new project at the Foundation, the Ahmanson Veteran Scholarship Initiative that is to recruit, educate and retain student veterans by removing obstacles that stand in the way of college graduation. “These men and women have given so much to our country. This is a way to restart their education and assimilate back to civilian lives.” For the past four years, the Foundation has given out grants to 24 private colleges and universities. Over 230 veterans are currently receiving assistance. Bill also enjoys leadership positions in many of the city’s most high-profile institutions such as LACMA, Center Theatre Group, Marlborough School, Petersen Automotive Museum and the Archdiocese Development of Los Angeles Board. 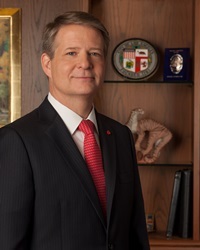 He has received many honors for his work including the National Association of Veteran-Serving Organizations’ Joseph D. Helton Jr. Award for Leadership; Walt Disney Man of the Year from Big Brothers and Big Sisters of Greater Los Angeles, where he is currently a Big Brother; and The Rotary Foundation’s Paul Harris Fellow award. When asked which award means the most to him, Bill answers that they all have touched him. But he adds, that after tonight’s ceremony, the Cardinal’s Award will be one of the awards he is most proud of including the honors that Pope Benedict bestowed on him, the Knight Commander of St. Gregory the Great and the Benemerenti Award.